From the earliest days of commercial gyms, young men have flocked to the iron game to combat their insecurities and weaknesses – if you’re old enough you’ll remember all those Charles Atlas ads on the back of comic books suggesting fitness and strength to keep bullies from ‘kicking sand in your face’. So it’s no wonder that to this day macho posturing often precludes maximum muscle building. Even many of the greatest pro bodybuilders started lifting due to real or perceived inadequacies or because they were being bullied or teased and felt the need to be bigger and stronger and display a more ‘manly’ persona. Nimrod King, former Canadian bodybuilding champion, was moved to Canada at the age of seven. While Nimrod was a common name in Africa, he quickly became the victim of abuse from his new schoolmates because of his name. Arnold Schwarzenegger, the best-known bodybuilder of all time, was bullied by his older brother & his father, who referred to Arnold as his ‘daughter’. The result? By 19 he was a European powerlifting champion. Let’s take a look at the dynamics of a proper squat: After placing hundreds of pounds on the bar you position yourself under it so that it rests where your back and shoulders meet your neck at the top of your spine. Then keeping toes, knees and shoulders in a vertical line, you squat down til your hamstrings touch your calves and rise back up again. Now think of the physiology – all of your nerves run up through your spine to eventually reach the brain stem. So unless you’ve already built up an inch or two of thick muscle at the top of your back, you’re putting hundreds of pounds of weight on one of the most delicate – yet important – areas of your body. When you consider that spinal damage is a leading cause of paralysis and that the neck-back tie-in is a common site for arthritis, you realize that padding the bar where it makes contact with the area is a wise idea – and bar pads made just for this are readily available. Yet gyms and the online weightlifting forums are full of slurs against their use and nasty comments about those who use them. But that’s not the worst of it… What’s worse is the drive to use as much weight as possible, regardless of range of motion or proper form. The need to brag about how much one curls leads many to swing up the weights using momentum and an awful lot of ‘body English’. How often have you seen someone twist their body through unnatural and dangerous positions just to curl a weight that’s obviously too heavy for them? Or overload the bar and then only do the top 6 – 12″ of a squat? And how many athletes, including powerlifters and pro bodybuilders, have been hurt while trying to set a new one-rep max? None of this is what building muscles is all about… Yes, strength training will help build muscle, but unless one is truly genetically gifted it’s a minor growth at that. To truly build maximum muscle mass your workouts need to incorporate full range-of-motion reps, done with increasing intensity. How do you increase that intensity? Not by struggling and cheating your reps due to an overly-heavy weight load. You do it by slowing down your movements, by adding more controlled reps, by shortening the rest time between sets, by adding in new exercises, by changing your exercise routine regularly and by combining any two or more of these progressions. 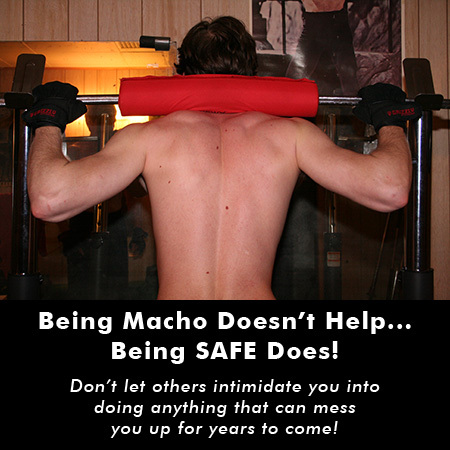 So when you hit the gym for your next weightlifting session, stay safe, be smart and work in your own best interest. Be sure your brain is engaged throughout every exercise, take your time and ignore the comments of the immature and insecure. 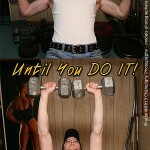 Keep your maximum muscle building goals front-of-mind and work out in a controlled, disciplined and intelligent manner. Rest easy in the knowledge that you’re building maximum muscle mass while they’re just feeding their bloated egos. This entry was posted in Building Muscles and tagged bodybuilders, ego, exercise, maximum muscle building, maximum muscle mass, muscle building. Bookmark the permalink.